Dr. Esther Chang has devoted her career to improving the efficacy of chemotherapy and radiation treatments. She has consistently been testing new therapies while simultaneously administering existing treatments. Her initial research focused on the genetic factors that lead to cancer. She looked at how some cells became malignant and then researched factors that could stop tumor growth, like the p53 tumor suppressor gene. Dr. Chang and her team developed a nanoscale drug delivery system that carries anti-cancer agents (like the p53 tumor suppressor gene) directly to both primary and metastatic tumor cells. In earlier work, they found that this approach significantly enhanced a tumor’s sensitivity to chemo and radiation therapies in complex tumor models of 16 different types of cancer, including head and neck, prostate, pancreatic and breast cancer and melanoma. Moreover, clinical trials are now treating patients with brain, pancreatic and other advanced cancers and preliminary results also appear to be promising. Using ovarian cancer models in recent experiments, Dr. Chang’s team successfully delivered the p53 gene to the tumor and sensitized the cancer to chemotherapy. In a majority of ovarian cancers, p53 is mutated or damaged and this may offer an effective alternative treatment for ovarian cancer patients whose cancer becomes resistant to first-line treatments. Esther Chang, Ph.D., received her bachelor’s degree from Fu Jen University in Taiwan and her Ph.D. from Southern Illinois University. Following her doctoral research, she held various positions at the National Institutes of Health, the National Cancer Institute (NCI) and the Uniformed Services University of the Health Sciences and Stanford University Medical Center. In 1996, Dr. Chang joined the Georgetown Lombardi Comprehensive Cancer Center as a Professor of Oncology and Otolaryngology and she is still on staff there today. In addition to teaching and conducting research, Dr. Chang is the President of the American Society for Nanomedicine and is an Executive Board Member of the International Society for Nanomedicine. Dr. Chang is the inventor or co-inventor of 115 issued patents and is the founding scientist and senior consultant for SynerGene Therapeutics, Inc., a privately-held company that has five ongoing clinical trials for two nanomedicines. 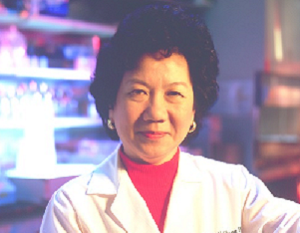 Throughout her career, Dr. Chang has published over 140 scientific articles and has served as a member of the scientific boards for the National Cancer Institute, NASA, the U.S. Military Cancer Institute and the Department of Energy. Your ticket for the: Esther H. Chang, Ph.D.